It was a tangible example of what the McElroys, who met 30 years ago while working in the oil industry, have experienced in their six decades cruising Louisiana’s bayous. They laugh at the recollection, but they know they live on the front lines of a worsening crisis. Not many people live full-time this far down the coast anymore; most of the houses around them, and even the local Catholic church, are used as seasonal fishing camps now. The McElroys are pretty convinced their grandchildren won’t be able to know and enjoy this region in the same ways that they’ve been lucky enough to. The iconic Louisiana bayou is full of cypress trees (Taxodium distichum) that can grow 100 feet tall and live 1,000 years. Cypress helps absorb and redistribute seasonal flooding in the swamp and thrives on a delicate balance between freshwater from the Mississippi River and saltwater from the ocean. The brackish mix feeds shrimp, oysters, redfish, and other species essential to the state’s seafood industry. Nowadays, however, the vegetation looks like somebody sucked the life out of the bayou: Wilting gray cypress skeletons stand in open water like wooden gravestones, and the tall marsh grasses have washed away, drowned by the encroaching Gulf. This natural defense system against storms is in dire shape. Beginning early in the last century, the U.S. government built levees, for storm protection, and carved shipping channels throughout the Mississippi River Delta. The oil and gas industry added its own cuts to the marsh starting in the 1930s, first in exploration efforts and later to facilitate the movement of drills, rigs, workers, equipment, and product. Cordoning off the river from its natural flow disrupted the natural creation of floodplains that occurred as the river deposited sediment along its banks. Industry operations had the added effect of removing resources beneath the swamps, which had been holding them up, and the land began to sink. Around every 40 minutes now, a section of Louisiana wetlands as big as a football is swallowed by the Gulf. Since the 1930s, Louisiana has lost nearly one-quarter of its wetlands—an area roughly the size of Delaware. The tidal marshes absorbed storm surges, diminishing the impact of storms inland. When Hurricane Katrina, a Category 3 storm when it reached the city, drove the ocean north, the loss of wetlands meant water struck the levees protecting New Orleans with that much more force, contributing to their collapse. Within hours, water covered more than 80 percent of the city. Experts say that if these trends persist, and if sea level rise is anywhere near predicted, Louisiana could lose a wetlands area larger than Manhattan every year. The levees that have been rebuilt to a “100-year-flood” standard won’t stand a chance against the full force of the ocean under the inevitable Category 4 or 5 storm. The McElroys grew up on the Louisiana coast. Bebe’s grandfather was a trapper, she says, who “dealt in furs from New York to Frankfurt, Germany, with a second-grade education.” Vic says his family moved down to Terrebonne Parish in the 1860s, migrating from Ireland at the end of the potato famine. They worked on sugar plantations, an industry that supported them all the way through Vic’s first jobs 100 years later. Both Vic and Bebe grew up exploring southeastern bayous in boats, navigating by using landmarks, mostly small coastal islands—many of which are now underwater. Physical maps are relics, and digital maps aren’t useful for more than a few years. Mapmakers scramble to keep up with the receding coastline. Louisiana is making a $50 billion bet that it can rebuild a significant part of its wetlands. Developed by the Coastal Protection and Restoration Authority, the State of Louisiana Coastal Master Plan is an example that can inform coastal populations worldwide on how to sustain their communities. Construction equipment has already been sent out into the open water areas that once were marshland to build a handful of islands and ridges to restore that natural defense system. The plan includes unleashing the Mississippi River a little, south of New Orleans, to let it do its original job of distributing sediment and building land. Previous river diversions elsewhere in the state have shown land comes back after as little as a decade. So while many are optimistic, the plan is only partially funded (the recent BP oil spill settlement will cover a few billion dollars’ worth of the price tag in coming years). If sea-level-rise projections are true—some scientists say up to four feet is possible in the next century, others say more—one of the boldest attempts at environmental protection and restoration could be compromised. A unique culture and history is at stake, one that survives off its knowledge and joy of its natural confines, and if forced to move inland like its beloved wetlands are doing, it, too, might disappear. We saw, 10 years ago, the horrifying consequences of doing nothing. Fifteen miles north of Cocodrie, where Terrebonne Parish dissolves into the coast, the Army Corps of Engineers (which bore responsibility for the New Orleans levees’ collapse, according to investigators with the American Society of Civil Engineers) is busy finishing a hurricane protection system near the town of Theriot (pop. 1,500). The Morganza to the Gulf system includes nearly 100 miles of levees meant to protect nearly 200,000 residents from storm surge and also protect what’s left of the local wetlands. This project is designed to work in tandem with, and is partially paid for by, the Coastal Master Plan. This wall will be the new last line of defense against storms and flooding. Billiot moved from northern Louisiana down to the southeastern bayou in the ’70s. She started working as a roustabout for offshore oil companies, the best-paying job available in these parts. Billiot started a family and had five kids; a few of them also wound up working in the offshore industry. Eventually she got her boating licenses, and after Katrina, she decided to get into charter fishing and tourism. First she did a little research. “I went on 22 different swamp tours in 2006 to see who was back in business,” she says. Most tours catered to out-of-towners looking to get an up-close glimpse of alligators. 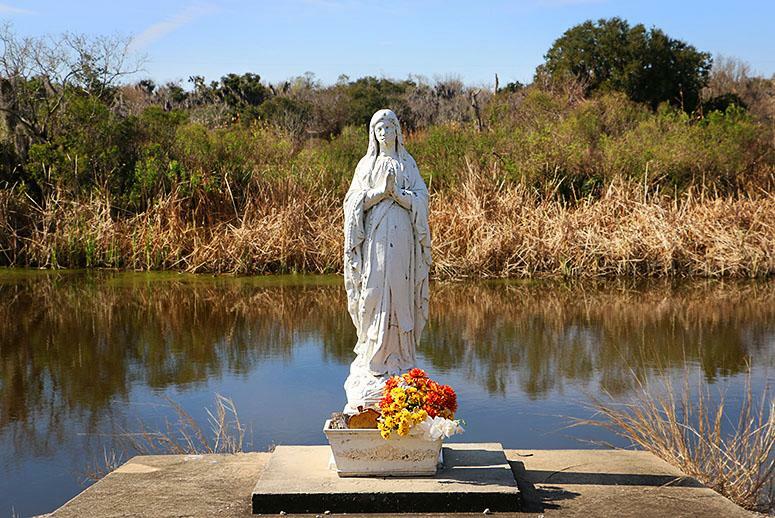 But she wanted to tell the story of how Hurricane Katrina destroyed miles of coastal wetlands—and might have done less damage inland had more wetlands been there to buffer the storm—and why the cypress trees in her backyard were dying. “When I moved here, those trees were alive and beautiful,” she says. RELATED: Will the ‘Great Wall’ Around New Orleans Save It From a Killer Hurricane? She waits at the local marina in Theriot in her skiff, a long white boat with a small captain’s console toward the stern. “Let’s roll,” she says, peering out from her sunglasses, pushing the throttle forward, and heading down the coastal canals that cross Bayou Dularge. Billiot’s history lesson reminds us that for 7,000 years, the Mississippi River pushed sediment that formed high ridges where various groups settled—Native Americans, then French and Spanish explorers, then African slaves. Nobody cared much about the bayou until the early 1900s, when the first successful oil well was drilled. The wetlands today contain some 10,000 miles of cuts in the marsh. Billiot stops to point out canals that lead to pumping systems; the long list of energy companies that have done business down here includes BP, Chevron, ExxonMobil, and Shell, many of which are still extracting oil from the bayou. Around 80 percent of the wetlands are privately owned; Billiot gets access to these areas through hunting and fishing leases sold to groups of locals so they can continue outdoor traditions. Metal gates block some of the canals, and in some spots, oil and gas companies have posted “No Trespassing” signs. As the Gulf of Mexico marches north, it’s hard not to imagine a New Orleans taking on the persona of a medieval city—surrounded by walls and a saltwater moat. That’s a reality that has already taken shape in New Orleans East, a part of the city bordered by water on all sides. Austin Badon has spent almost all of his 60 years in New Orleans East and today represents the neighborhood in the state legislature. Much of this area of town was built in the swamp, so some houses are as much as 10 feet below sea level. Driving along Bullard Avenue, Badon conjures the post-Katrina scene: “There was a boat going down this street—it had a wake behind it. The water in my home was probably the height of an average kitchen sink.” His district lost its hospital, and many schools had to be demolished. Though much of Badon’s district is covered in asphalt, he shares some things with coastal residents like Billiot: They’re racing to save the state’s wetlands. They have a bayou that’s not able to do its job. Badon is not sure many of his constituents are aware of the severity of the crisis, noting that it’s often hard for big-city residents to relate to the concerns of people who live in coastal communities like Houma and Grand Isle. “We’re close to the coast, and yet we’re not on the coast,” he observes. Even with the new levees around New Orleans, the city’s residents may soon need to start following their coastal neighbors’ lead: Save the wetlands, elevate their homes, or leave. A short drive from Badon’s district office on Highway 10 is Bayou Bienvenue, on the border between New Orleans East and St. Bernard Parish. Badon steps out of his SUV at the foot of a marsh that’s more water than vegetation. His dad used to take him fishing here when he was a kid: “I remember being in the boat and having to go straight [through wetlands] before I could go left or right. But now, you can see where the land has gone. It’s not there anymore. The grasses have all gone.” The spot now offers a clear view of downtown New Orleans. That clear path to the city will be a problem considering the 130-mile-per-hour winds of a Category 4 hurricane and its accompanying storm surge. • Will the 'Great Wall' of New Orleans Save It From the Next Killer Hurricane?